I've always wondered why, among all the people who grew up in the PlayStation era, so few who spent their time obsessively playing games ended up in medical school. The answer may be that the ones who made it just don't want to fess up to the hobby. Some aren't ashamed, of course: A classmate of mine who chose neurology as a specialty once had a long talk with me about Warcraft III tactics. 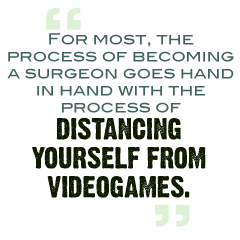 But for most, the process of becoming a surgeon goes hand in hand with the process of distancing yourself from videogames. Which is why I find the state of videogame research when applied to surgery so amusing. Videogame advocates eager to show how Rise of Nations makes you less senile should be eager to dissect the current literature on surgical skills and gaming, because it doesn't resort to tenuous links between knowing when to Age up and knowing when to refinance your mortgage. Instead, it examines a form of surgery called laparoscopy that has several elements of gaming to it. Laparoscopy, or the use of small abdominal incisions to introduce instruments and a camera into the abdominal space without the need for open exposure, requires the real-time translation of a two-dimensional representation (the camera image on the monitor) of a three-dimensional space (the patient's abdomen) through the use of vaguely gamepad-like controls. A standard camera is angled at 30 degrees, introducing yet another spatial reasoning hurdle. My first attempts at laparoscopy were ridiculously clumsy, but they were fortunately performed on a pig in junior resident training lab. That was about one month after I had impressed a roomful of my fellow residents by performing a series of ball retrieval maneuvers on a virtual reality machine. When they turned up the difficulty, though, I fell flat on my face.